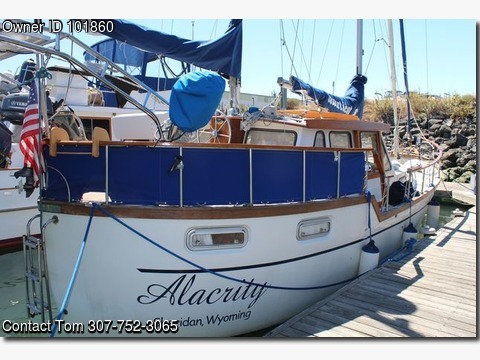 Please call the owner Tom at 307-752-3065.Boat is in Anacortes,Washington...'84 Nauticat 33 Pilothouse Motor Sailor. This well-built Finnish boat has two private staterooms and two heads. The spacious galley settee converts to a double berth for a total of six sleeping spaces. Warm, dry and comfortable in all types of weather; ample storage for short or long distance cruising. Very seaworthy with canoe stern. New AGM batteries, new Magna inverter/charger, and new Maxwell electric windlass with 35 LB CQR anchor with 200' of chain with an additional 200' of rode. Deck redone and topside painted in 2014; bottom paint in 2013. Very economical 90 HP Ford Lehman engine with dripless shaft seal and newer prop. Newly recovered cockpit seat; new high grade upholstery on all interior cushions, window sunshades and new curtains. Dinghy davits for inflatable and 2 HP Honda outboard. Many more features and upgrades.